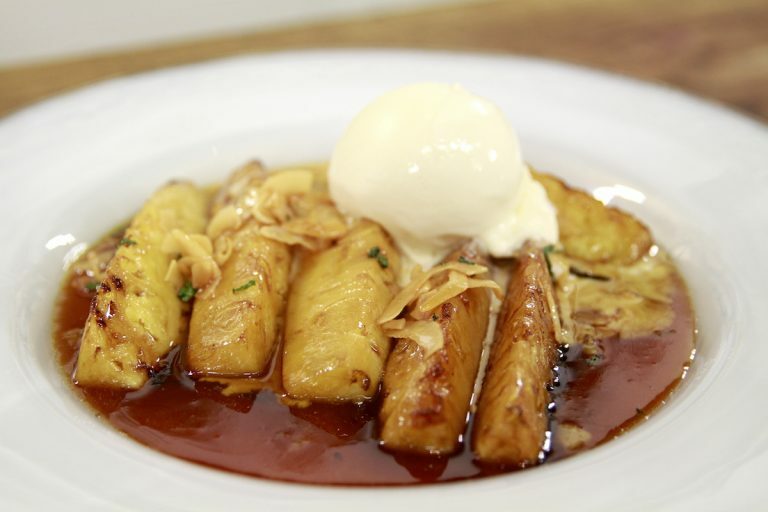 This Roasted Pineapple with Caramel, Rum and Coconut has two different types of liqour in the recipe and is served with ice cream! Roasting the pineapple really brings out the beautiful flavour and the result is sticky, sweet perfection! Place a non-stick frying pan over a medium heat and when it is hot add the butter. When the butter has melted add the pineapple and the brown sugar. Make sure the pineapple is coated in the sugar as it melts, then place in the oven for 5 minutes. To make the sauce heat a second non-stick frying pan over a medium heat until hot then add the caster sugar. When the sugar has caramelised add the alcohol and spices then whisk in the butter, sultanas , coconut and mint. To serve: place the pineapple onto a plate, spoon over the sauce and scoop on the ice cream.